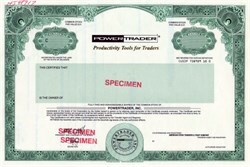 Beautiful engraved specimen certificate from the Powertrader, Inc . This historic document was printed by United States Bank Note Company and has an ornate border around it with a vignette of the company name. This item has the printed signatures of the Company's President, Michael C. Withrow and Secretary. The Company designs, develops, markets and supports informational and analytical desktop decision support and risk management systems for both securities professionals (including securities brokerage firms, investment advisors and trust companies) and individual investors. The Company's products enable its customers to capture an incoming stream of market data, store such data for future reference, display selected data in tabular and graphic form and analyze the data to discover trading opportunities. The Company's systems have been licensed to more than 200 users. Marketed directly, as well as through distribution partners such as and Hongkong Bank Discount Trading Corp., in the United States, Canada, Europe and the Asian/Pacific region, the company's products are believed to offer a unique combination of analytical capabilities and trading information.